This week we are continuing our discussion about the definition of an “enterprise” under TABOR. If you missed Part 1 of our discussion, please click here for that article. Part 1 focused on the definition of an enterprise and what kinds of activities might qualify as enterprises. But might there be a time when the activity of an entity is too tenuous to qualify as a business? The 2015 and 2016 debates around the hospital provider fee are illustrative of the difficulty in determining what a government-owned business really is. The hospital provider fee was established in 2009 under the Health Care Affordability Act of 2009. This act requires Colorado hospitals to pay a fee to the state, which, when added to certain state funds, is then matched through a federal government program. The fee is combined with federal money and the total amount ($805 million dollars in FY 2015-16) is distributed back to Colorado hospitals as compensation for health care services provided to individuals covered by Medicaid. The fees paid by the state hospitals are currently counted as state budget year revenue under TABOR and count toward the state’s budget year revenue limit. Because state revenue has been forecasted to exceed the limit, some have proposed creating an enterprise to collect the hospital provider fee. Removing the fee revenue from the calculation of the state’s budget year revenue, would allow the state to collect other revenues without exceeding its TABOR limit while still ensuring that the hospitals can receive state and federal moneys for the provision of Medicaid services. 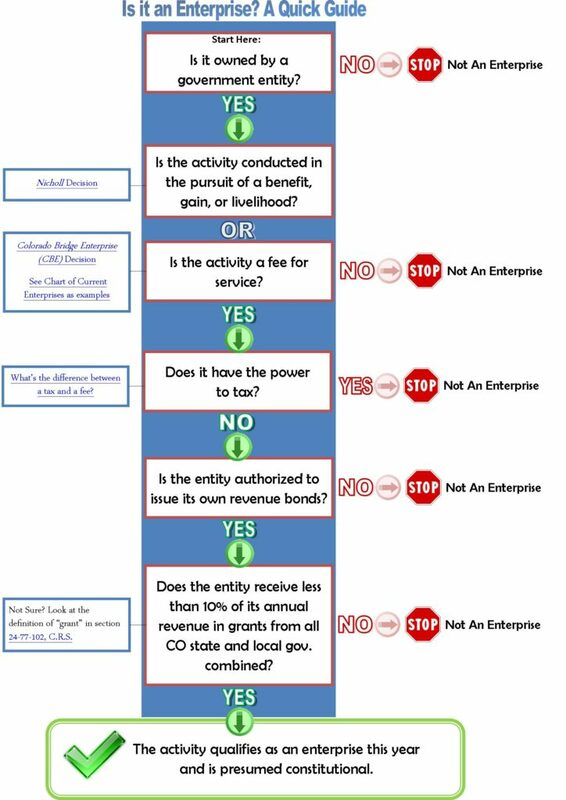 At the time the hospital provider fee enterprise was first proposed, no new statute had been written or court decision rendered about the definition of an enterprise since the Colorado Bridge Enterprise or CBE decision. As a result of the debates over the proposal, several new opinions are now available regarding the matter, one from the Office of Legislative Legal Services (Office), one from practitioners in this legal area, and one from the Colorado Attorney General. Our Office’s opinion, dated December 31, 2015, states that, while legislation enacted by the General Assembly is presumed constitutional, an enterprise created only to charge and collect the hospital provider fee is not a business for purposes of enterprise status under TABOR. The conclusion hinges on the fact that all the entity would be doing is collecting money to leverage and obtain more money from the federal government. If that is all the entity would be doing, there would be no “fee for service” because there is no real service being provided. The opinion also relies on there being no private sector analogue for paying a fee in order to leverage that fee to seek matching federal money for Medicaid services. Not everyone agreed with our Office’s conclusion. Trey Rogers of Lewis Roca Rothgerber Christie, LLP, and Jon Anderson of Holland & Hart, LLP, issued their own opinion on February 11, 2016, concluding that since the fee is collected to access a program that helps hospitals defray the costs of providing medical services to Coloradans who could not otherwise afford to pay for health care, there is a “fee for service” and the activity qualifies as a business. They further argue there is no requirement for a private sector analogue after the CBE decision and, even so, the service provided by the entity would be similar to services provided by insurance and investment brokers to the private sector. The hospitals paying the hospital provider fee are paying the entity their money in exchange for access to greater returns, the increased amount of federal money available to reimburse the hospitals for the provision of Medicaid services. On February 29, 2016, Attorney General Cynthia Coffman released her opinion on the matter, concluding that a hospital provider fee enterprise would survive a constitutional challenge. First, she points to the enactment of the hospital provider fee as a fee, not a tax, thus ensuring the entity does not have the power to tax, something the Nicholl decision held to be inconsistent with the characteristics of a business. Second, the Attorney General argues that the fee pays for services that reduce the amount of uncompensated care hospitals are exposed to. Finally, she points out that the entity would be financially distinct from its parent government, a fact that both the Colorado Supreme Court and the Colorado Court of Appeals found important in their respective Nicholl and CBE decisions. While the hospital provider fee enterprise debate was continuing, the General Assembly created a new enterprise in 2016. Senate Bill 16-115 creates an electronic recording technology board, which is allowed to impose an electronic filing surcharge when someone records a document with a county clerk and recorder. This fee is to be used to develop and modernize electronic filing systems throughout the state. As stated earlier, legislation passed by the General Assembly is presumed constitutional. But, what is the fee for service here? A better filing system? Fewer headaches when recording deeds? Being able to electronically access recorded documents? It’s not really clear what specific service patrons recording documents with county clerks and recorders will be getting for this additional surcharge, but it’s arguably an activity conducted in the pursuit of a benefit. Taking all of these opinions, the newly created electronic recording technology enterprise, and the presumption of constitutionality, where do things stand on the definition of an enterprise for purposes of TABOR? We’re still not absolutely certain, and the analysis has clearly evolved over the past 24 years. Each proposed enterprise needs to be considered in light of the relevant court decisions, legal opinions, and examples of existing enterprises. Members of the General Assembly are encouraged to contact the Office to discuss whether a particular activity may appropriately be characterized as an enterprise under TABOR.